The beautiful island of Kiawah is located 20 miles south of the historic and beautiful city of Charleston, S.C. Here is information on renting our 1,400 square foot 3 BR cottage. We have availability year round and with various rates. Our Sparrow Pond Cottage is located in Kiawah's West Beach overlooking lush maritime woods with many deer and birds to watch. The cottage location is excellent! It is on a private Cul de Sac with the beach, Sparrow Pond Pool, Cougar Point Golf Course, West Beach Tennis Club, Straw Market Shops and Restaurants a short walk away. FREE use of Sparrow Pond Community Pool and Bath house which is located on the way to beach access. Only pool on the Island that is not owned by the Resort and is free to guests staying in Sparrow Pond Cottages. 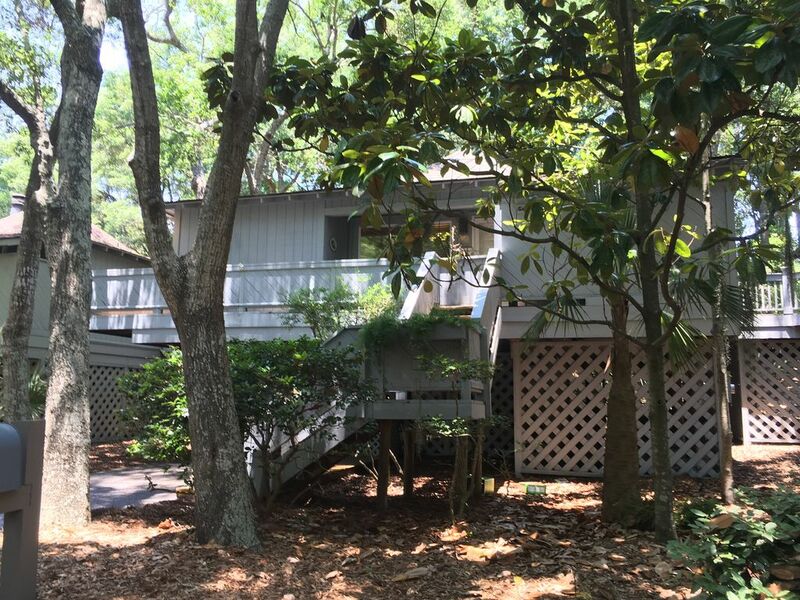 This 3 BR cottage sleeps eight by utilizing the sleeper in the family room. There are 2 full Baths recently renovated. The master bedroom, equipped with a queen size bed overlooks the woods and opens onto the deck and has an adjoining bath - also has TV with DVD. Guest bedrooms - one has queen size bed (with TV/DVD other twin beds (TV/DVD) Living room has fireplace and TV with DVR with AT&T Uverse cable system throughout the home. Family Room has TV with DVD player and CD/Tape Player Stereo System. Family room opens to a screened porch which has a wicker seating group. Updated kitchen with granite countertops. Kitchen is fully equipped with a self-cleaning oven, microwave, refrigerator, disposal, coffee maker, toaster, etc. and all the kitchen utensils you will need. Hardwood floors throughout the home. There is a separate laundry room with washer and dryer. Outside shower is also available. There is a wrap around deck on the side and front of the cottage. Side deck has wrought iron patio table and chairs and lounge chairs making a perfect setting for meals and relaxing. Front Deck /Porch has swing from which you can hear the surf most of the time. Gate is located at entrance to front deck/porch that is lockable for your kids safety. Sheltered parking for 2 vehicles beneath the unit. Charcoal grill provided for downstairs use only. Gas grill on upstairs deck. The cottage has central air conditioning, and there are also plantation ceiling fans in all the rooms. Linens and beach towels and chairs are provided. Provide for Children: High chair, Pack and Play with sheets, bed rail. Weekly rates include complete clean-up to make your stay more enjoyable. Stays of less than one week will have an additional cleaning fee. Weeks that include Holidays have special rates. Our cottage is equipped to make your stay pure pleasure. Come and enjoy your holiday in an environment of casual good taste. For your pleasure and ours, our cottage is a no smoking home. On the short walk to the beach you will pass the swimming pool for Sparrow Pond Cottages which is Free to guests of our cottage. Only pool on the Island not owned by the Resort. To use other pools you have to be staying with the Resort. Beach activities, biking - 30 miles of paved bike paths and also can ride bikes on beach, hiking, swimming, golf, tennis, fishing, crabbing, boat rentals, kayak and canoe rentals, wildlife viewing, birding, shopping, restaurants, museums, sightseeing tours, swimming, snorkeling/diving, sailing, surfing, windsurfing, shelling, Night Heron Park - soccer fields, basketball courts, Nature Center, Kamp Kiawah for Kids, Cookouts, Ice Cream Socials, and horse back riding available at nearby Seabrook Island. We can recommend Bike Company that will deliver bikes for rental at rate of $28 per week. We can also recommend a babysitter for you who is an elementary school teacher. We love it and know you will as our guests. Kiawah is quiet beautiful beach setting with wonderful golf and tennis. Renovated kitchen with granite countertops. The owners of this cottage provide all the comforts of home in this clean and cozy cottage just steps from the beach. Not only is the cottage pet-friendly, but it felt very inviting with nice sheets, soft towels, a fully supplied kitchen (plenty of pans, dishes, glasses, etc., as well as essentials such as salt & pepper, spices, flour, sugar, detergent, paper towels). It is spacious with 3 bedrooms, living room, den and porch. The beach is a short walk away and the grocery and town center is a bike ride or short car ride away. The neighbors are friendly and the neighborhood is quiet. This is truly a perfect spot on the island. Can't imagine staying anywhere else! Thank you! Overall a very nice, well maintained unit. House was nice and well kept. But every time we tried to hang the key on the wall the hook fell down. Inspection revealed the screw was too small and the whole in the plaster was stripped. I'd suggest a plastic anchor and a bigger screw. So happy that you enjoyed your Kiawah vacation at our home. Please come again and make more cherished memories. Thanks for letting me know we need to repair the key holder. Beautiful cabin and close to pool and beach. Had a great time. Recommend! The house was great. Clean and well stocked. Short walk to beach. Loved it. I recommend sparrow pond cottages. Quiet and relaxing. Cheryl was helpful and quick to respond. Thanks again. KIawah Island located 20 miles from Historic Charleston. Kiawah is exclusive private gated island with 5 championship golf courses with Golf Learning Center and 2 renowned tennis villages Ten miles of scenic beach front and miles of bike and walking trails. Activities: Biking on the beach and bike paths, Fishing, Crabbing, Swimming, Boating, Surfing, Kayaking, Shelling, Birding, Wildlife Viewing, Sightseeing, Museums, Shopping, Restaurants, Kamp Kiawah, Kiawah Nature Center at Night Heron Park, Freshfields Village, Bohicket Marina & Yacht Club, The Sanctuary Hotel and Spa, Antiquing, Winery, Outlet Mall, Horseback riding, Aquarium, Plantations & Gardens, Etc. Kiawah has earned many national awards: Southern Living Magazine - Kiawah 'Best Spot to walk the Beach and Most Romantic Sport'; Travel Channel - Kiawah 'America's Best Nature Beach'; Conde Nast's #3 Island Destination & Golf Resort; Golf's Digest & Top Courses; Tennis Magazine ranked #2 '50 Best U.S. Tennis Resorts'. Tax-12.5%. Winter Weekly Special Rate of $695. Our rates vary with time of year. Rates are negotiable for Spring, Fall, and Winter as to number of guests and bedrooms used. Great Deals for Couples and Families with Pets. There is no additional charge for departure cleanup for weekly rentals. Rentals for less than a week can have a cleaning charge added. There is a 12.5% sales/accommodations tax as required by the State, County and Town added to the rate. Minimum stay of 3 nights during fall, winter, and spring. Pet fee is a refundable deposit if there is no damage or flea problems.